Wow what a buzz, Mike, you're on- last time I used my first digital camera , my beloved Olympus 5050Z, it had a really weird multicoloured pattern all over the pics- I'll shoot some "creative" stuff- it's the middle of winter downunder in Aus, and pouring with very welcome rain, so here goes!!! Will also try out a Zeiss Tenax c1932 with a square format 24mm x 24mm pic on 35mm film which I've never used. I'm looking forward to this! What do you mean by "...make the JPEG you submit look like what the camera's results looked like". A capital idea!! I'm on it right away. I just got hold of a Voigtländer Bessa I ca. 1950 and waiting for the films to come back from development. Should qualify if there are no light leaks in the bellows. Cool. Just bought a Olympus Trip 35, can't wait to try it out. Great idea. One of the better competitions I've heard of recently. I have an Agfa Isolette & Minolta 126 camera. Sounds fun- and Bruce, I'm midway through my first roll in a Tenax myself! I have a zenit photosniper. If I don't put my back out, I'm in. This is fluxxy. I shoot a picture with this old camera and then I process the film. I have a print made and then I scan the print. What if I make the print myself? Not allowed to manipulate the print in the darkroom? No dodging/burning, no choice of paper> developer>dilution>temp>toning, wrinkling, spindling, ...?? there are problems with the rules...many of the personal and technical aspects of making a photograph are being eliminated here. I'm shooting with an old Zeiss Ikon medium format folder..the results I get are never what I want...not even close. The same goes for my digital RAW files. this is a great idea..should be very funny to see how many "I will never touch film again as long as I live" types will be coughing up a pack of the stuff and trying to remember how to load oneofthemthere analog thingies. Hey, i bet you'll start a trend and a bunch of cumbersome DSLRS will be left sitting lonely on shelves as more than a few will find themselves blissing out during their happy second honeymoon with a classic beauty! Do whatever you want. You will find that management is not picky. Anyway, I like the idea a great deal, and I will see what old funky camara (I am an Oly nut, so perhaps an old XA or Pen F) I can dig up. Nikon has released the D700; can the 5D be considered ancient and forgotten? Not quite, but soon, very soon. I have been cleaning the Baush&Lomb lens on a Kodak Autograph Jr. that looks uncannily similar to the camera shown in the post. Can´t ignore such a coincidence as that. The camera was found in the attic at my in-laws. Now if only I had ever used 120 roll film an knew where to get some I could get right on this assignment. "Labor Day in the U.S. falls on the first Monday in September." - and UK Summer Bank Holiday (known as August Bank Holiday) falls on the last Monday in August. Many European countries (and presumably other Christian nations around the world) have 15th August as a holiday to celebrate the Assumption so we can all find an easy to remember target date for this exercise. I've already got a head start on this challenge Mike - having opted out of the DSLR rat race for the time being I buy and sell old cameras on eBay. They're chosen out of curiosity rather than inherent value but I can usually get a better price on resale by describing them as "recently tested with film". Maybe I already have a suitable candidate, a Japanese designed, made in Korea, only sold in UK & Commonwealth, 1960's rangefinder. Will pop a roll of XP2 in it at the weekend. Maybe I will hit a few resale/antique shops this weekend and try to unearth a relic. Fujica 35EE on its way out of the attic right now! You realize you’ve just given a huge number of photographers an excuse to go buy a new/old camera, right? 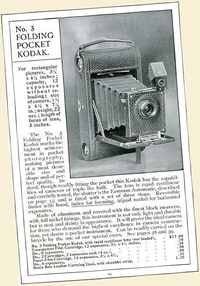 Well I've got one of those pocket Kodaks illustrated in the above newspaper clipping - picked up in a junk shop becuase ... well, why does anyone pick stuff up in a junk shop!? Anyway, never actually used it, so maybe now is the time. Anyone know what size film I need for it - and is it still available? My Elikon Avtofokus is winging its way here from the Ukraine as I write. Mike, you're on! Ooh, lovely! I have an Agfa Isolette II which an eBay vendor chucked in for free (yes - you read that correctly - free!) with another camera I bought from him. Given his generosity, I've always felt slightly guilty that I've never used it - so this would seem like the ideal opportunity. Is an M2 funky yet? Or was it always? Hello, I am an about a month long reader, first time commenter... Thank you for thinking up this little project! I have an old camera, it actually is the predecessor to the No. 3 Kodak you have pictured above, it's the No. 2C Autographic Kodak Jr., that I got from my grandpa about eighteen years ago, that I have always wanted to pull out and try using... well, you gave me the reason to finally do so! I do have a question to you knowledgeable TOP'rs - what still currently produced film will be able to be used in it? It shot A-130 film, 2 7/8" x 4 7/8" in size negatives... 120 film? 220? I also have this novelty Nishika N8000 3D camera that my dad found, who knows where, about a dozen years ago and gave to me... another excuse to play with it and run a roll through it. Anyway, thanks again. I am happy to have found this site and fellow lovers of this awesome medium that we adore! All the best to all of you, and happy shooting! I am reading this while waiting for a flight from Tunis home. In the last few days I have looked at several film cameras that I was itching to buy, but could not think of any reasonable excuse. Why didn't you get this out a few days sooner? "Is an M2 funky yet? Or was it always?" It is if you want it to be. That's the beauty of a "challenge." I've had a Pentax K1000 lying around since I got it as collateral baggage in an eBay auction. Always wanted to try it out, and this sounds like a great opportunity. I know it's not exactly ancient or funky, but I'll slap a 50mm f/2 on it and see what happens; I can also use my fully manual Tokina Spec 135mm that's at the bottom of the draw because it's too long for digital. "But Mike, what should we shoot? Does every frame have to have our feet in it? ;-)"
No, the original assignment--anything you want to. Just shoot, is all. because Mike is the gatekeeper. As the saying goes, "All rules are arbitrary and the decision of the judges futile." If the photo you submit is more a demonstration of your post-capture technical prowess than the camera's capability and your native pre-capture eye, you have not met the spirit of the rules. If anyone feels the need, I can give a set of step-by-step instructions for preparing your file in ACR and Photoshop. But, really, if I need to do that, you're likely not having enough fun, yet. Yes, I should just add a Rule 9: Ignore these rules if you're of a mind to." ...Except that 800-pixel-wide files really do work best, because they're big enough to see but don't clog up my inbox. But really, if anybody has a bit of an experience with an old camera, that's enough for me. If we get to see the results, so much the better. As I read this I glanced at the hall book shelf, just stuffed with old cameras (but mostly Olympus Pens) and so paralysis sets in. I think that your challenge has identified my chronic problem, too many cameras, too little time. Dear Mike, I'll be happy to adopt your little-loved and forgotten Contax IIa or Leica IIIf at no cost to you whatsoever. Does Fuji make a 3 1/4 x 4 1/4 chrome film? I have a Graphic GRAFLEX sitting on my bookshelves. I'll consider participating if I can find a roll of 620 film somewhere ... or if I can find a 620 reel on which I can spool a spare roll of 120 Fujichrome. "........if I can find a roll of 620 film somewhere"
620 film is still made, go to B&H and buy until your hearts content. this is such a great idea. Which camera shall I pick? I have the Franka Solida folder (120 film) I just picked up this past weekend at a stoop sale (New York for yard sale), or the Balda Baldi folder (127 film) my wife got me for my birthday, or Zeiss Baby Box (also a gift and also 127 film), or the shoebox size Kodak that takes 122 film (postcard size negative) where the lens is behind (!) the shutter and aperture blades. I might have to break rule 8. Mike, I hope you can post the entries in a gallery where we can easily view the images and cameras used to take them. Instigator! (But that's a *good* thing.) (^_~) Made me finally go to eBay and buy one of the old cameras I've been thinking about getting for quite a while. I have several folders in working condition tho may submit an entry made with my (original) Diana. Long live film! You've brought to life an old box that was inching closer each day to the monthly good will donation. "No, honey, I know I'll use it one day". Finally, I have. The camera was a gift from my mother-in-law who inherited it when her father passed. When I opened it to load my first roll, I discovered, to my surprise, an exposed roll of Kodacolor X C-22 film. Of course, I can't wait to get my more recent roll of Kodak Portra processded, but I'm even more interested in how I get the memories off that roll of C-22. Any ideas on a lab that might reliably process it for me?